Renault petrol powered tractor at Porte Maillot terminus. 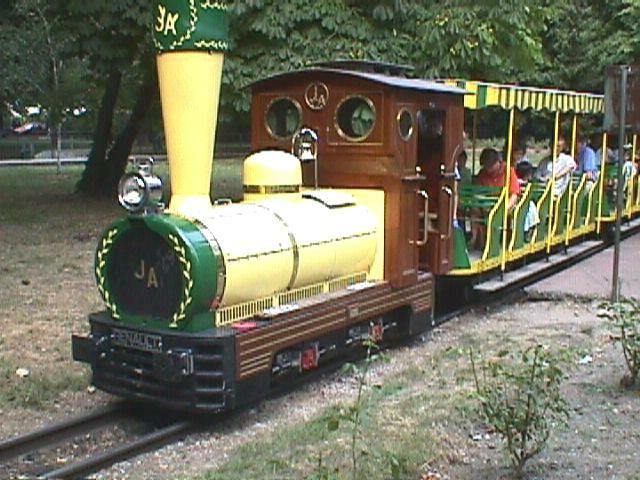 Description: A 50 cm gauge railway linking the Porte Maillot to the Jardin d'Acclimatation with a "dogbone" layout, in the Bois de Boulogne, Paris, France. 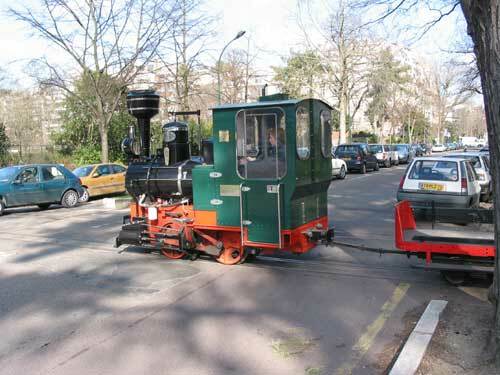 This light railway is probably the oldest regular rail service in Paris. 1878 - Opening of an experimental, short lived, line by the Decauville company inside the Jardin d'Acclimatation (following the refusal of installing a 50 cm gauge railway within Paris Universal Exhibition of 1878). 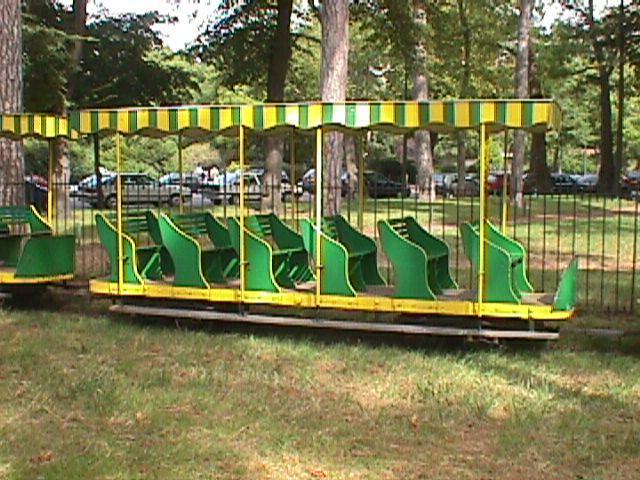 Ten coaches - seating capacity 8 - hauled by two ponies were used on this 1500 meters line. Speed reached 15km/h while the line could accomodate up to 3000 passengers on peak Sundays. 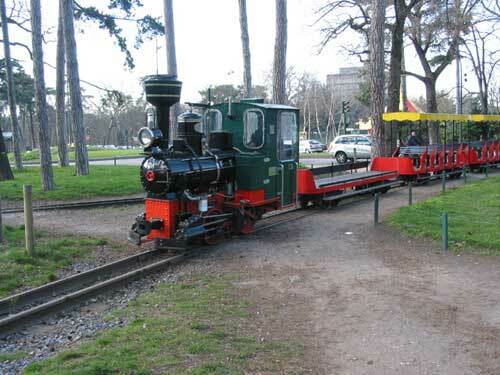 1880 - A new company built a line from Porte Maillot till the Jardin d'Acclimatation. Operated by horse drawn cars. Minimum radius of curves: 8 to 15 meters. Length: 5 km. 1910 - Petrol (or accumulator ?) traction replaced horse drawn trains. 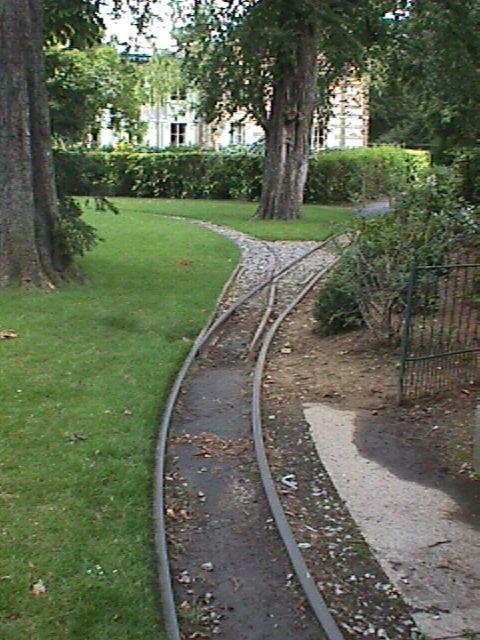 1930 - Line is reduced in length at both extremities, due to the construction of a car subway under Porte Maillot on one side (terminus is transfered to its current location on the route des Sablons) and the abandonment of the track within the Jardin d'Acclimatation itself. 1945 - Due to petrol shortage in the aftermath of WWII, batterie operated tractors (probably coming from the 1937 rubber tyres train operating in Paris Universal Exhibition of 1937) are put into use. 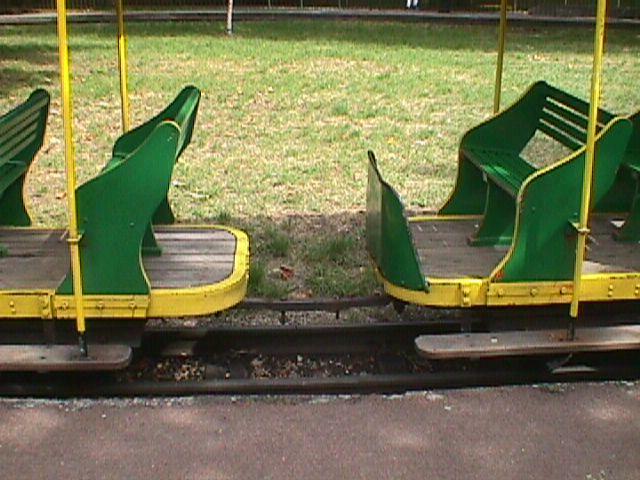 Rubber wheels were operating outside the running rails. It seems however that the former petrol operated tractors were quickly put back into service. 1960 - Replacement of former tractors by 7 new Renault petrol powered tractors (with a steam engine look body). These new tractors are 3.05 m in length, 1.20 m wide and 5 tons weight. Their 55 HP motor ensure a 19 km/h top speed. The rolling stock composed of open cars, "toastrack" type, remained unchanged except for a hard top added during the 1950s. Jardin d'Acclimatation, Paris official web site (in french). "Les Tramways Parisiens", by Jean ROBERT, 3rd edition (1992). Edited by the author. "Decauville, ce nom qui fit le tour du monde", by Roger BAILLY, AMATTEIS Editions, 1989. All pictures Copyright © by Frederic Delaitre, 1999. Detail of "Eugénie" cab and driving controls. "Toastrack" trailer on the line. 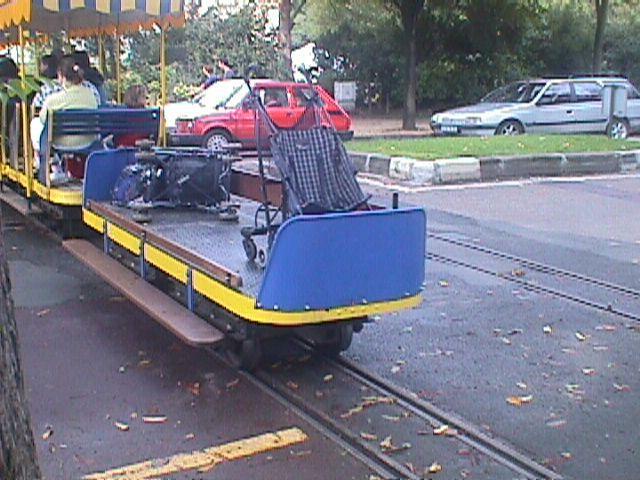 In order to overcome difficulties in the transportation of the numerous prams carried by visitors in the toastrack trailers, the JA workshops have built in 2001 this flat car (probably on the chassis of a passenger car). 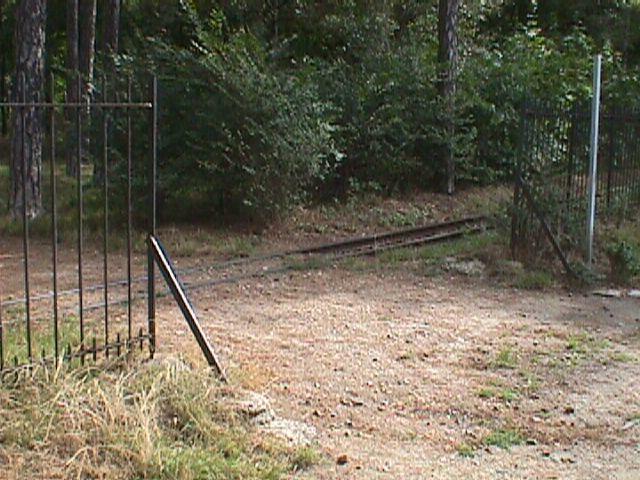 Picture taken at the Route des Sablons level crossing in September 2001. Detail of the rather crude "link and pin" coupling between trailers. 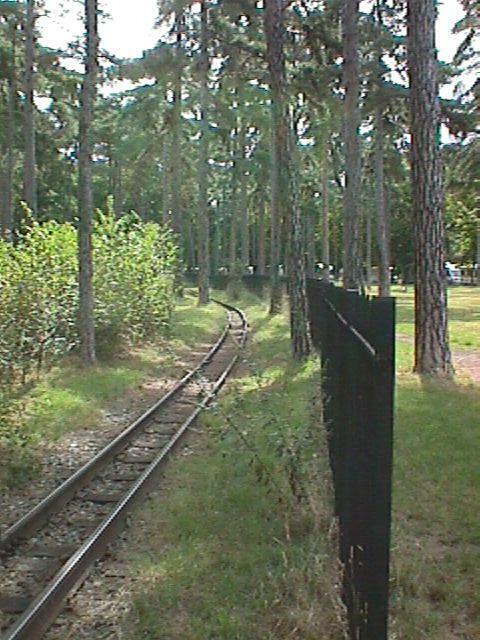 A stretch of double track near Porte Maillot. Level crossings on the line are somewhat primitive. 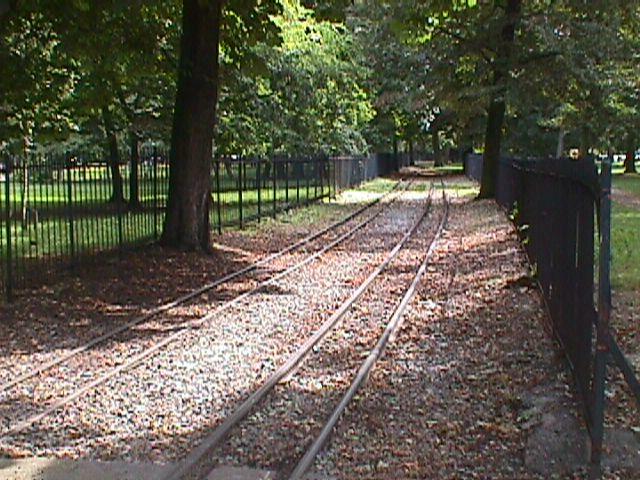 A typical stretch of line near the Jardin d'Acclimatation. Another stretch of line, note the protection grid on the right. 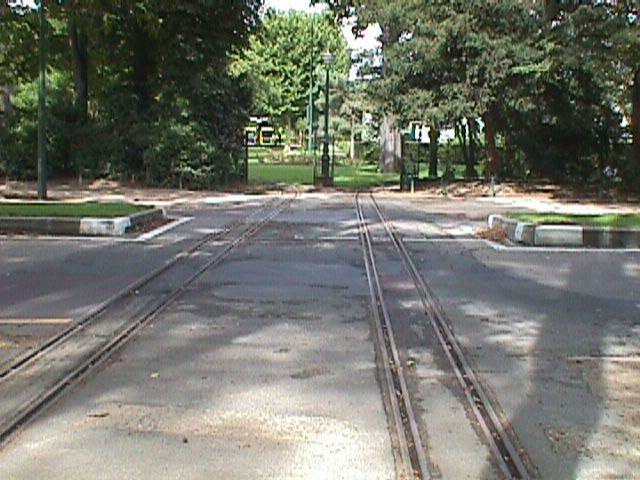 Level crossing on the Route des Sablons and entrance to the Jardin d'Acclimatation. 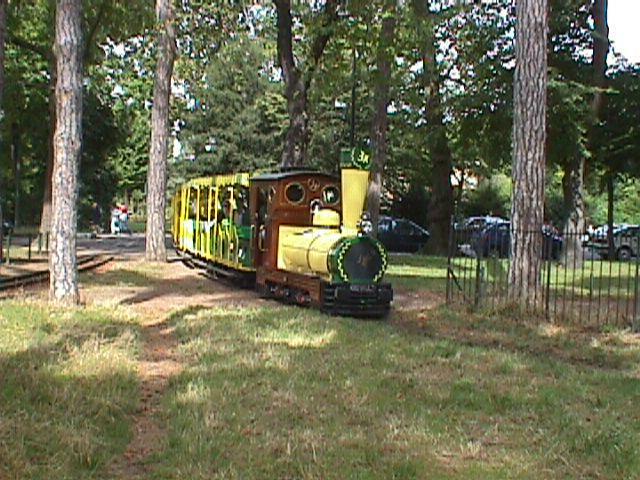 A train at the route des Sablons level crossing. 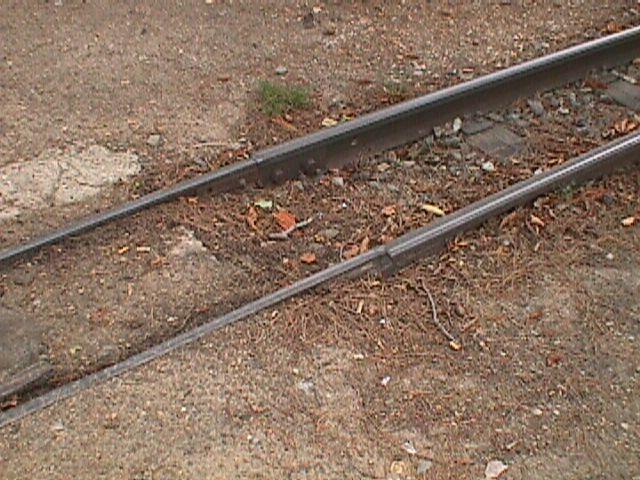 Two rail profiles near the road level crossing. Light rail, Decauville style, on the left and more "main line" type rail on the right. Heavy rail bears the mention: "DUDELINGEN 1898 5JG". 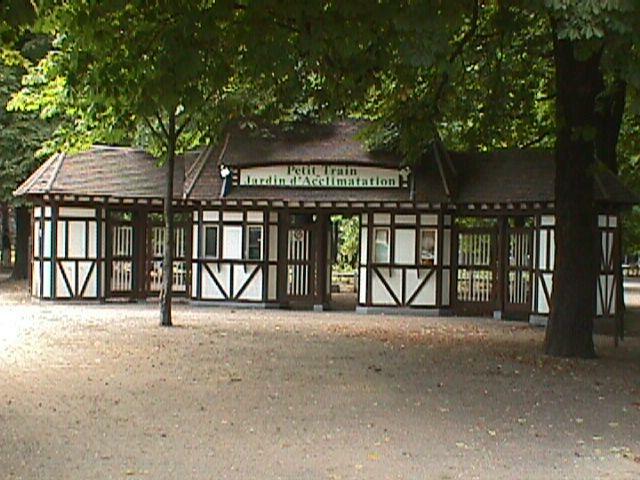 Jardin d'Acclimatation station and car shed (middle) with the track loop on the left. 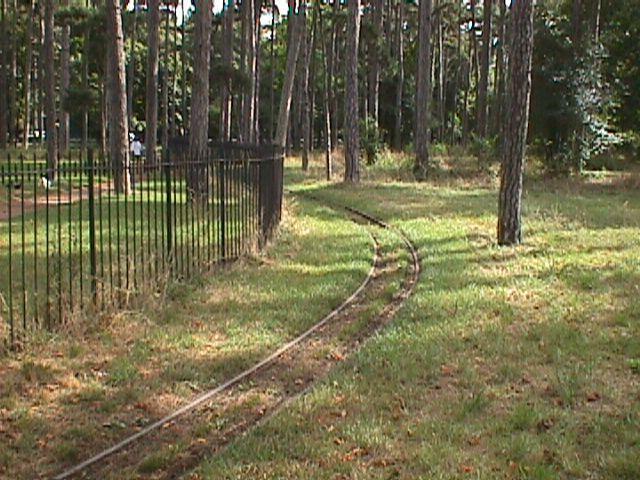 The track inside the Jardin d'Acclimatation, on the left: a disused loop. 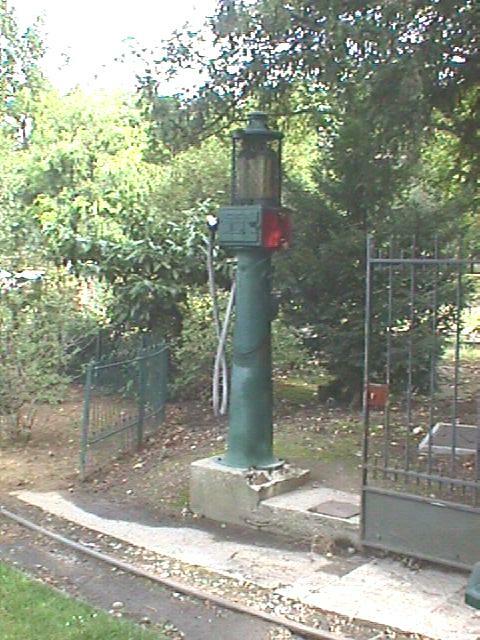 Old style petrol pump for loco refueling at the entrance of the Jardin d'Acclimatation. A new addition to the locomotive roster caught in action with a train bound for Porte Maillot. 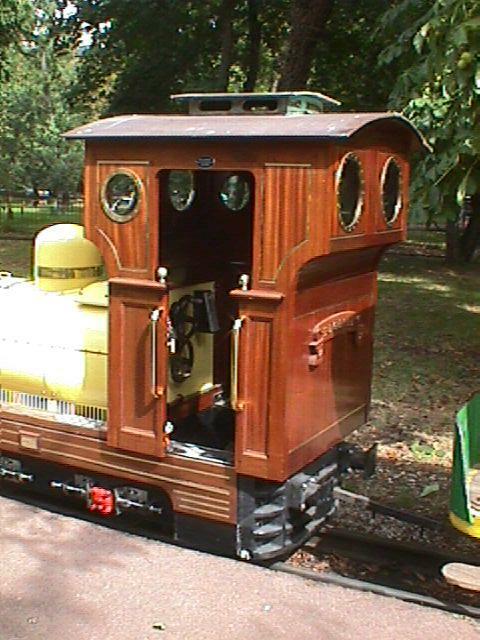 The German influence of this 0-4-0T is evident (looks . The loco includes a steam like sound system, not powerful enough to cover the noise of a less romantic petrol engine. 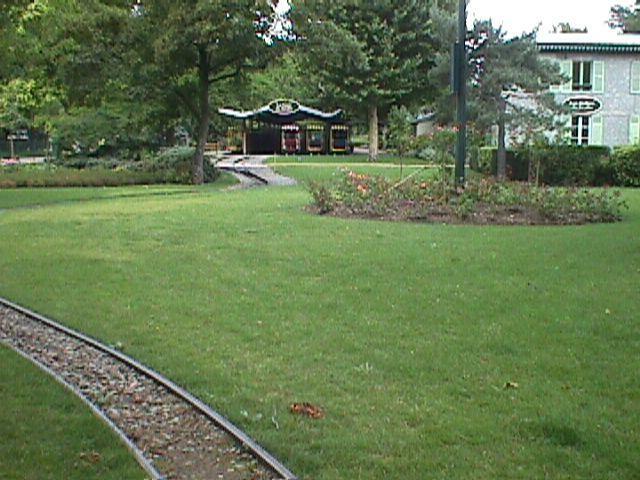 Crossing the Route des Sablons and entering the Jardin d'Acclimatation. One may note the closed cab, a nice feature for the train driver in Paris cold winter of February 2004.